AINZ&TULPE, the largest cosmetics shop in Japan, has created “Look”, an interactive shop window experience providing multilingual support for shoppers looking for a makeup experience. Over 10 million people from around the world visit Tokyo each year. Cosmetics are one of the top three items that they purchase and take home. However, as only 3% of Japanese people can speak a foreign language, foreigners have difficulties choosing products in Japan. This interactive experience provides a way forward. 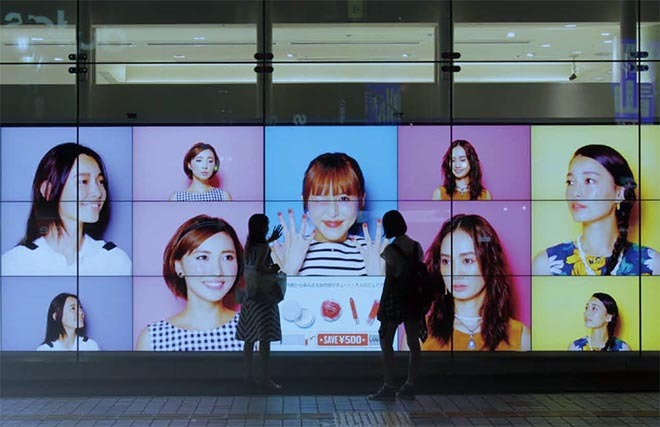 There are over 10 types of fashionable Japanese faces displayed on the signage. The faces were produced using only products sold to AINZ&TULPE by Japan’s top makeup artists. Those fashionable faces detect people’s movements and faces. When a person selects a fashionable Japanese face to his/her liking, coupons, makeup methods, and more are issued in that person’s native language using facial recognition. If the person brings a coupon into the shop, not only are items used to create that face discounted, an experience is provided to all people in which makeup is applied to resemble that fashionable Japanese face in only three minutes. See more on the project on the AINZ&TULPE site. The AINZ&TULPE Shop Window experience was developed at Dentsu Inc, Tokyo, by creative director/planner Reietsu Hashimoto, account executives Koji Makino and Nanae Suzuki, PR team Shingo Hiraoka and Ryo Nakagawa, working with AINZ/TULPE marketing director Kaori Ishikawa. Production was done at Puzzle Inc, Tokyo, and Birdman, Tokyo, by general producer Daima Kawamura, producers Nozomu Naito and Mitsuaki Hongyo, production manager Ayumi Matsumoto, interactive director Roy Ryo Tsukiji, technical director Takeru Kobayashi, director Yoichi Kanazawa, art director Junya Hoshikawa, designer Ryota Mishima, device engineer/programmer Yohei Kajihara, programmer Shudai Matsumoto, web developers Koumei Sato and Takashi Tsushima, set designer Kiyoharu Mitsui, makeup artist Kazuko Hayasaka, writer Yuka Hashimoto, director of photography Yosuke Nakajima, stylist Maki Takeda.